Last month’s approval of a New Development Bank loan of US $200 million to expand the Durban container port occurred without the Sandton-based bankers doing adequate consultation or analysis. This is not only unacceptable in a democratic society, especially for such an important and controversial project. It also makes mockery of claims the Brazil-Russia-India-China-South Africa (BRICS) bloc acts differently than arrogant Washington bankers. For decades, the South Durban Community Environmental Alliance (SDCEA), with members from all races and classes, has opposed the ultra-polluting port-petrochemical complex. Container trucks are especially damaging, with one careening off Field’s Hill in 2012, killing two dozen kombi passengers – just one of an annual average 7000 truck crashes in Durban. SDCEA is opposed to the massive truck logistics park proposed for the Clairwood Racecourse due to its threat to nearby schoolchildren’s safety. Although concessions were belatedly won from Engen, British Petroleum and Shell on long-overdue sulphur scrubbing at the continent’s largest refinery complex, it was not long ago that Merebank’s Settlers Primary School had a 52 percent rate of asthma, the highest ever recorded at any school. Leukaemia is still a South Durban pandemic, with rates 24 times the national average. Nevertheless, Transnet’s new US $1.8 billion pipeline anticipates doubling both refining and Durban-Johannesburg oil transport capacity. Four multinational corporations – Italy’s ENI, Norway’s Statoil, United States of America’s ExxonMobil and South Africa’s Sasol – are doing exploratory oil and gas drilling four kilometres deep in the dangerous Agulhas Current offshore Durban. This expansion is occurring not only when SDCEA demands a local fossil-fuel detox, but so does the world due to the looming catastrophe of climate change. Evidence is growing ever more obvious, especially in damage to Transnet’s own Durban facilities during last October’s super-storm: a ship lost its moorings and blocked the harbour, and overboard containers let lose 49 tonnes of plastic nurdles, which continue to destroy marine life. Transnet’s oil pipeline was originally budgeted at just US $45 million. In addition to incompetence in mega-project design – as even State Enterprises Minister Malusi Gigaba confessed in 2013 – one reason for massive cost over-runs was the line’s rerouting from the white areas of Hillcrest and Kloof to South Durban’s black neighbourhoods. SDCEA is opposed to Transnet’s environmental racism. Moreover, the University of KwaZulu-Natal Centre for Civil Society and Birdlife South Africa also challenged Transnet’s Environmental Impact Assessments in 2012-14 due to historic climate denialism and the harbour’s ecological degradation, forcing further delays until Transnet reworked its proposal – but still not to the critics’ satisfaction. The likely collapse of the large sandbar near the container terminal will demolish vital bird and marine breeding grounds. In addition, ordinary citizens now care much more about Transnet malgovernance. Few were surprised at this month’s revelations: further fraud associated with Chief Executive Officer Siyabonga Gama’s attempted US $75 million illegal procurement contract with the German firm SAP, a confessed ally of the Guptas in other improper deals. BRICS bankers may need reminding that Transnet got a loan of US $5 billion from the China Development Bank during the 2013 BRICS summit in Durban. Gama and Transnet’s then Chief Executive Officer Brian Molefe contracted Chinese state-owned Shanghai Zhenhua Heavy Industries to build the world’s most over-priced container cranes, which included pay-offs to the Gupta brothers’ empire. Also thanks to the loan, South China Rail supplied locomotives, but with 21 percent kickbacks to the Guptas worth more than US $400-million. These sweet deals are economically irrational. “Blue economy” job creation promises don’t hold water here, for port expansion typically includes “4th Industrial Revolution” robotics; the new mega-ships that carry upwards of 10 000 containers now have fewer than 20 crew. Durban is already one of the world’s most expensive ports for container handling, even before an expensive new foreign loan for overpriced infrastructure is factored in. Transnet also fails to consider rising world economic volatility – such as Donald Trump’s protectionism against South Africa steel, aluminium and car exports – and the general downturn in world trade (measured as a share of gross domestic product—GDP since the 2007 peak). 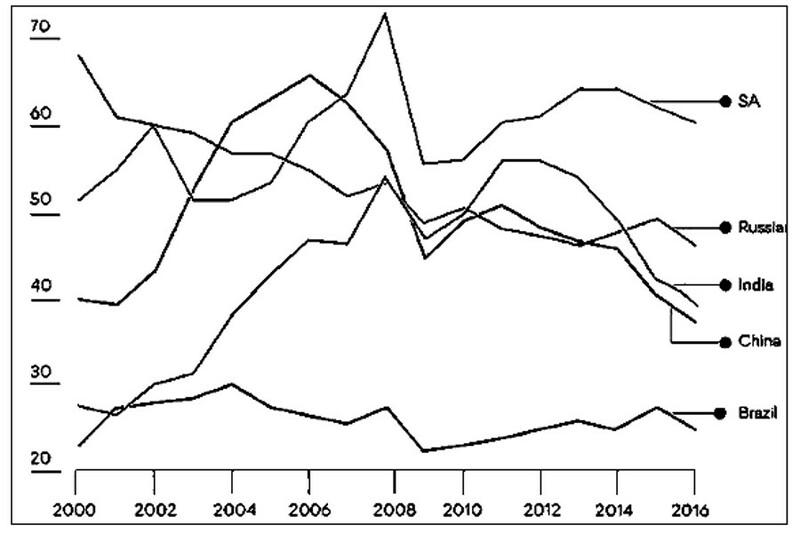 For example, total South African imports had risen from 18 percent of GDP in 1994 to 37 percent of GDP in 2009, but then fell to 30 percent last year. This is a problem shared by all the BRICS, measured as both imports and exports as a share of GDP in 2017: Brazil dropped from its historic peak of 30 percent in 1994 to 25 percent; Russia from 68 percent in 2000 to 45 percent; India from 56 percent in 2012 to 40 percent; and China from 68 percent in 2006 to 38 percent; and South Africa from 72 percent in 2009 to 61 percent. 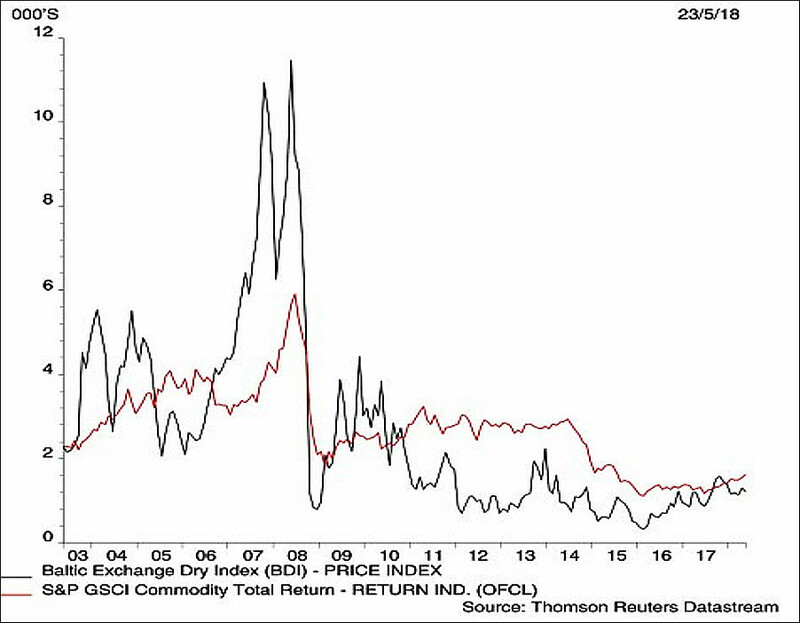 Two other revealing indicators that move in tandem are the global commodity price index – though of more relevance to Richards Bay and Saldanha than Durban – and the Baltic Dry Index, which is the best indicator of world shipping’s health. The Standard & Poor commodity price index reached 5900 in 2008 before falling to the 1500-2000 range since 2015. The shipping index fell even further, from 11500 in 2008 to below 1500 since 2014. Even several years after the 2008 crash, the 2012 National Development Plan insisted on expanding the port-petrochemical complex all the way into the old airport, as a new “Dig Out Port.” Reality intervened, for in 2016, when digging was meant to commence, Transnet was forced to announce a delay until 2032 due to flat shipping demand and sky-high costs. Transnet’s dollar-denominated loan will add to South Africa’s potentially unrepayable foreign debt, which recently rose to more than 50 percent of GDP for the first time ever. Severe repayment pressures are expected by Treasury within a year. Indeed this loan – like the US $3.75 billion World Bank loan to fund the Medupi coal-fired power plant, which SDCEA led national opposition to in 2010 – should be declared “Odious Debt” for which a more democratic future government will declare to be in default due to lender liability, corruption and poor planning. Last month, Finance Minister Nhlanhla Nene became chairperson of the BRICS Bank. Nene laudably fought against the US $100 billion Rosatom nuclear reactor deal in 2015, when that appeared imminent thanks to memorandums of understanding Jacob Zuma signed at the BRICS summit in Ufa, Russia that year. As a result, in December 2015 he was notoriously fired – supposedly so as to become the BRICS bank’s local branch manager. That position was only a fig leaf and never materialised. Nene should very quickly come up to speed and learn why the Bank’s Africa Regional Centre in Sandton was slated by Auditor General Kimi Makwetu on grounds of “fruitless and wasteful expenditure” last November. The employees there failed to even bother checking Google, where they would have learned about on-going SDCEA protests against Transnet. Instead, BRICS bankers may be beholden to the BRICS Business Council, whose five South African members include Gama and Mediterranean Shipping Company director Sello Rasethaba. SDCEA will be protesting this loan and other features of corruption, maldevelopment and climate change at the BRICS Business Council when it visits Durban and also the BRICS heads of state when they come to Sandton, in late July. Similar protests in 2013, when BRICS leaders were at the Luthuli International Convention Centre, apparently did not work – not even enough to get consultation on the US $200 million loan – so activists must redouble their efforts and society must be vigilant against on-going residues of these Zupta-style mega-projects. * Desmond D’Sa is Coordinator of the South Durban Community Environmental Alliance and a 2014 Goldman Environmental Award recipient; Profesor Patrick Bond teaches political economy at Wits School of Governance, is an honorary professor at University of KwaZulu-Natal’s School of Built Environment and Development Studies, and authored Politics of Climate Justice (2012) and Unsustainable South Africa (2002).